He speaks the truth. Most early recordings were done in one single take, or perhaps two. In the U.S., for the most part only the best selling artists, generally pop or jazz artists, were allowed multiple takes. Lesser-known or rural musicians and singers had to be prepared to bring their best to the session. Perhaps this is a more salient factor to ponder in terms of global musicians in cities or rural villages, most of whom were never in a million years given more than one chance to record their songs. And Dean was speaking of the U.S. niche country and blues markets of the 1920s. What about the super-niche markets of, say, Malaysia, Uzbekistan, or Tunisia during the first decade of the 20th century? One would imagine that those musicians had even less room for error, if that’s at all possible. Then again, ten to twenty years before U.S. companies were recording their own country’s rural or regional musics, their sister companies in Europe had been traveling much of the world in search of these niche markets and recording thousands of records. Sure, most likely the European engineers had no idea what they were recording and disliked the music, but they were captured, nontheless. Today’s post is an example of the thriving market in the Middle East. Over 100 years old, it is a genuine artifact. Even in beautiful shape, the surface noise that is normal from recordings of this vintage is unavoidable. A tangent: if you are interested at all in old recordings of any stripe, you must learn to love surface noise. It has, in a way, become part of the music itself. I’m speaking of the inherent sound of needle on shellac groove, not necessarily damage to the record itself. (If you’re not already familiar, there’s a whole arcane language that has evolved around 78rpm damage: tics, pops, lams, hairlines, stressed grooves, edge chips…sigh.) Remastered CDs that remove all semblance of surface noise inevitably end up removing much of the music itself, and a crucial part of the listening experience. Wow. This blog has shared so many amazing recordings (and information about those recordings, which too many blogs lazily do not do). This one blows me away. I’m amazed at the number of recordings these European companies made–I wonder, is there any move to create some sort of archive or definitive accounting of what exists out there? I’m plenty has been lost to war and the simple passage of time, but it seems that some central information source would be useful and go a long way toward preserving some of this heritage. Absolutely, perhaps we’ll all work towards that someday. And thanks again for the kind words. 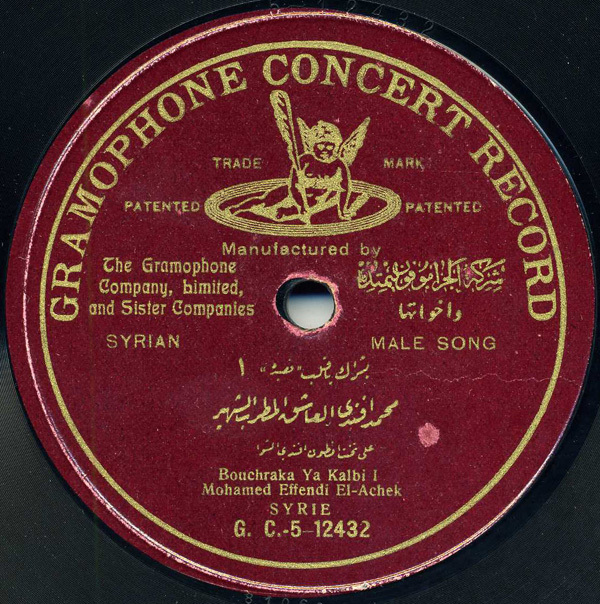 According to one of Paul Vernon’s articles, over 300,000 recordings had been pressed in the Middle East by the late 20s alone. That’s a figure I think about frequently and am staggered by. Or how about the country of India – something like 400,000 78s of Indian music were pressed before the LP and 45 took over. How much of that is available today? A miniscule fraction, probably. These 2-sided posts are so great that they make me wish all your posts included both sides of the record. Maybe someday? Thanks, Dax. I like to post both sides of most records where the same song is split into two sides (with some exceptions)…’course, sometimes it all comes down to time. Glad you’re enjoying them! Fantastic track! I would love to use it in a short film. Please could you contact me so I can show you the project I am working on. I can’t post it publicly as I don’t have all the permissions yet.